How to spatialize the taste of wine is perhaps less important than the legal grounds of defining who has a right to produce wines of a given name. 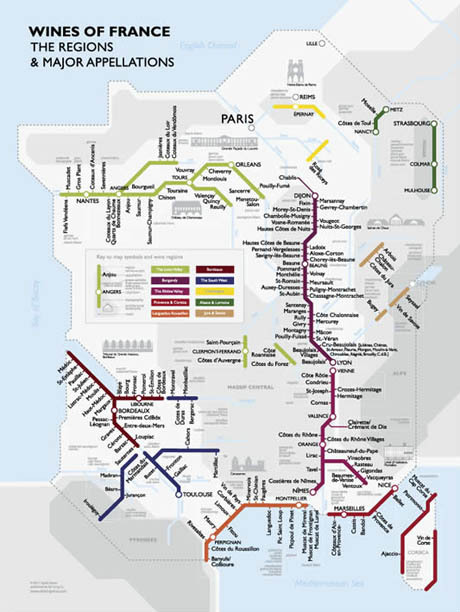 But the wine map has become a genre in its own right to link the sensory experience of wine-tasting with the geography of place. Especially in an increasingly homogenized spatial landscape, the preservation of place and locality–denominations or appelations–that guarantee the specificity of wine-quality by not only a legally defined and protected classification of geographical indication, but a preserve a sense of the landscape as defined for wine-growing. The image of the California’s wine productions noted in barrels and clusters of grapes in an old tourist poster of the state for San Francisco’s Wine Advisory Board in ways that beckoned visitors to rural areas of the state, distanced in their symbology from AAA maps of the region’s roads and even from motor travel, but seemed to transport one to a land of barrel-rolling and wine-sipping that recast the state in predominantly rural terms where wine-growing occurred exclusively in a set bucolic regions removed from urban life. While selectively omitting any sense of urban settlement or indeed automotive conveyances, the Wine Advisory Board seems to have been designed to seduce visitors by the cartographical vignettes of relaxing workers and relaxed banjo-playing, in ways that naturalize the wine-growing as part of the landscape in order to boost local wines an era when California reds were often cast as the poorer cousin of fancier French wines. To make the point that the state was so nourished by the year-round sun to be the land of wine-growing, oak barrels are plentiful from Santa Clara up past Mendocino, in an alternate tourist map that suggested how wines themselves transported one to the vineyards of the California countryside. There was a time when the bounty of wine harvests in Northern California led the region to be cast as a site blessed by vineyards and grape harvest, where the light of the sun distinguished the Napa and Solano Valleys or the grapes of Sonoma as winemaking towns in a predominantly rural idiom. But more than any other impression, one can sense by the map’s vintage that oenology is not, in the American West, at this time a refined science, so much as an almost rustic pursuit, destined for tourists and removed from the pressures of urban life: much as the wines are themselves able to transport one to an idyllic rural setting, removed from race, class, work, and urban congestion, to a landscape in which one might leisurely repose. Little sense of knowledge about wines seems important. 1. For in California, the notion of terroir is absent. Indeed, the precision or authority of the claims of individual growing regions of viticulture that has become so important in recent years was long completely absent. The division of such divides reflect–and have common origins with–the proliferation of descriptors that are usually blamed on Robert Parker, who enriched the descriptive language of wine-drinking with terms as acidity, astringency, jamminess, balance, and oakiness who also bequeathed the notion of “intellectually satisfying” wines to underscore the discriminating judgement involved in tasting good wines that so effectively remapped wine-drinking as a learned intellectual experience to bring it out of the rural land in which much California wine-growing was long symbolically enshrined. Claiming his place at the avant-garde of bucking this trend in cartographical symbology, northern California-based oenophile David Gijsen recently returned to the mapping of northern California vineyards and varietals in recent years. 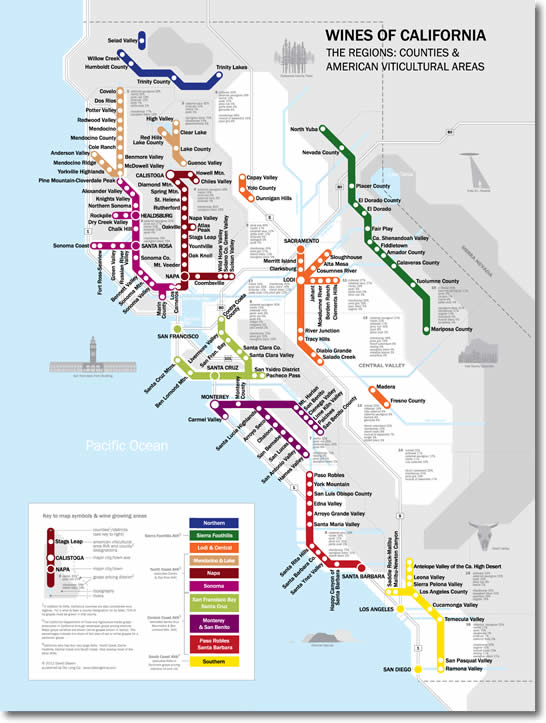 Gissen followed the recent trends in mapping mass transit when he decided to remap his adventures in wine-tasting to distinguish his adventures in wine-tasting in the region, and cleverly adopted an image familiar from public transit to suggest how California wine-tasting has become a new mass-experience, tied to how we experience the wine-growing regions of the state. Rather than employ the agrarian images of bountiful vineyards, his symbology shifted the metaphorical rooting of a wine’s terroir in a bucolic agrarian setting of the vineyard. And in place of evoking (and romanticizing) bucolic fields of grapes, his map charted vineyards to reflect the dominant destination of wines’ identification for an urban audience who traveled to the nearby Napa Valley to experience its wines at first hand in ways that communicate the crowded weekend highways filled with pleasure-seeking wine-tasters, as much the countryside. Gisssen made good on his credentials as an architectural theorist in order to map the local California wines with a very welcome sense of humor–a sense of humor all the more welcome given the disproportionate weightiness and serious stakes that is often associated with the mapping terroir. Terroir is, at base, an economic reality for wine producers. But the tourism of wine tasters is increasingly part of the travels to vineyards and tasting houses, and their experience is increasingly reflected in maps of place–they are, indeed, among the most common audiences for these maps. 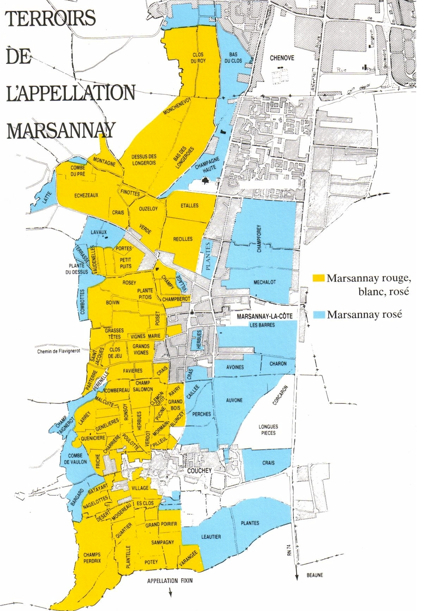 In shifting the demarcation of regions to boost trust in the origins of provenance of a given region’s wines, Gissen reflects an urbanization of most wines’ market and (without stating it too openly) reflects the re-marketing of the terroir map as something of a guide to local wines: yet, as Gissen notes, “the urban sense of wine has yet to receive a visual language” outside of pastoral aesthetics of most terroir, and he seeks to offer one. 2. 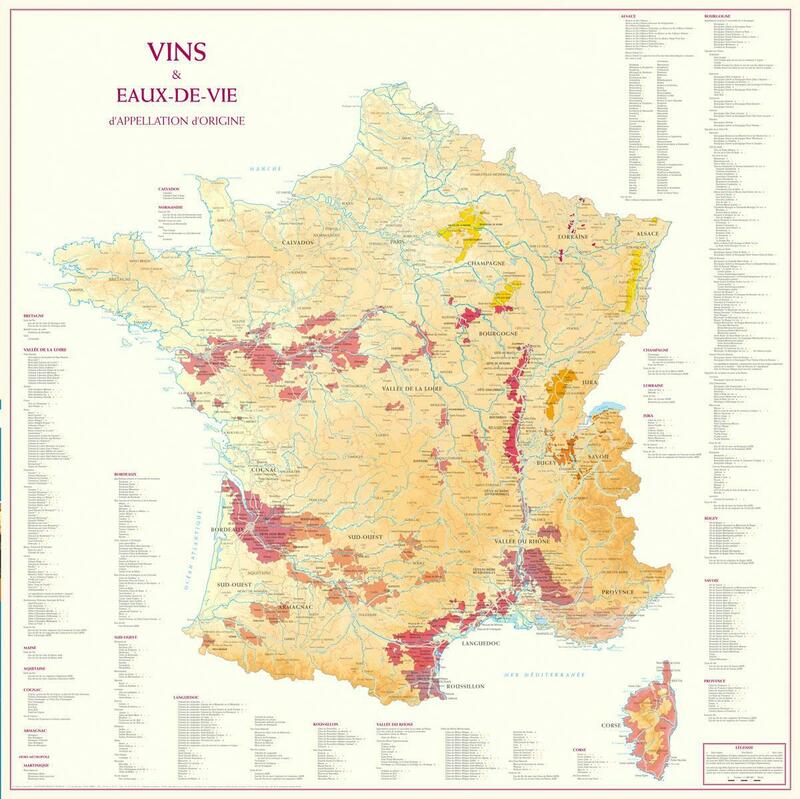 Maps have long served to perpetuate the mystification of terroir by tying the identifying characteristics of wines to terms easily recognized by an audience of consumers. 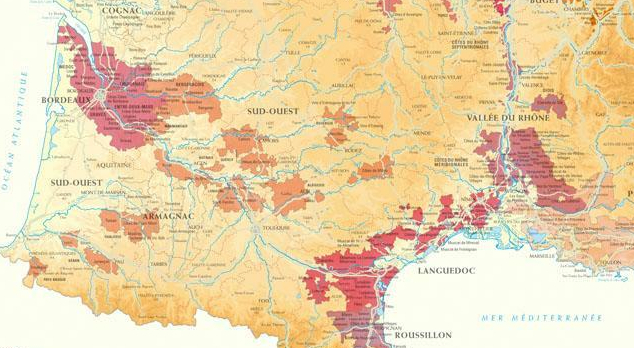 Of course, the practice mapping regional terroir derives from the French system of Appellation d’Origine Contrôlée (AOC), now widely adopted in other wine-producing countries to precise the geographic location of grape production. The currency as an index of quality (and fetish) that terroir has acquired–and how it has been mapped to other regions as a sort of patent or fair-use standard of appellation–suggests a sort of viticultural zoning and essentialization of provenance. Charting terroir demands an intense attention of the interaction of vine and environment based on creating a public record of long-cultivated local expertise of agricultural ecosystems–even if this sounds like a contradiction of sorts: the sense of where you can cultivate grapes, or whose land is used for viticulture, reflects a historical messiness that territorial bounding of a set of fields dignified with one wine-type can’t really reflect. 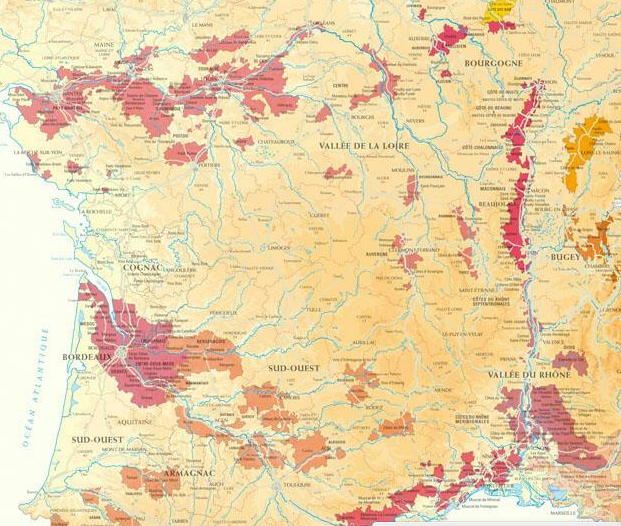 The reduction of wine-types to the production of a given region, while intended as a protection for the producer to combat fraud, is often essentialized, leading to the widespread display and currency of terroir maps in wine stores that reflect on the consumers’ interest in selective drinking as a sign of social distinction; in other terms, the concept of terroir, derived from “terre” (and territoriality) confers cultural status to a wine’s taste–and effectively elevates the price one is willing to pay. 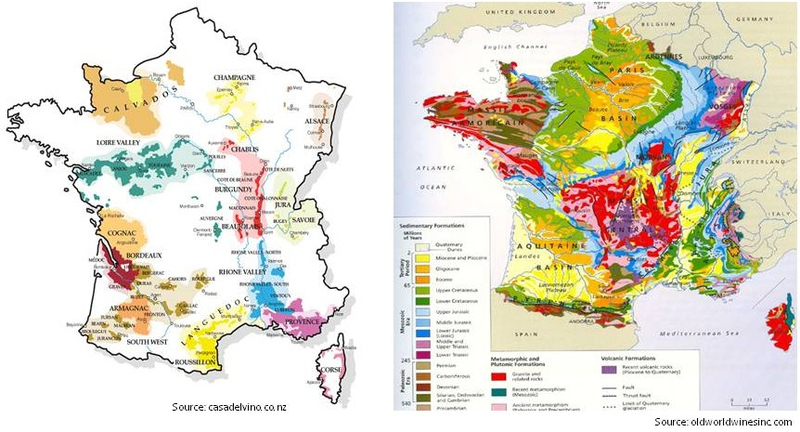 The notion of appellation is less about contiguity or clear cultural divides, however, than the sorts of soils and climates that serve best to define a wine making practice and taste, even as these are cast in apparently objective terms in a culture that privileged a univocal authoritative cartography. 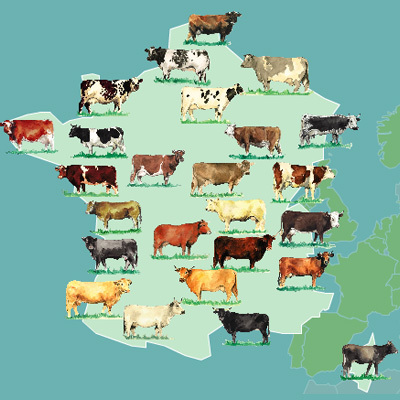 To be sure, the notion of a transparent mapping of “one wine, one region” seems informed by the administrative mapping of a gastronomic landscape that mirrors the division of France into discrete administrative Départments, which it sub-divides and refines. 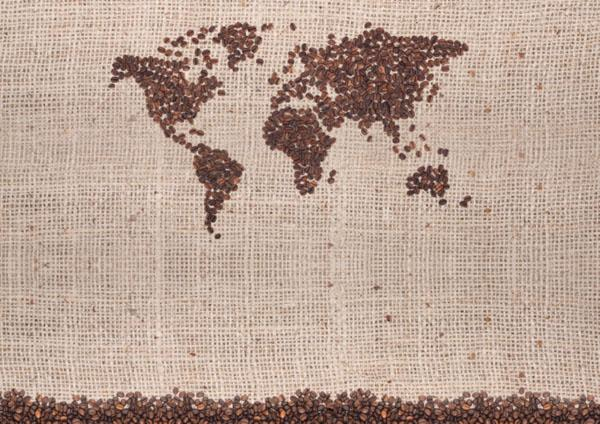 There is a similar mapping of economic exchanges rooted in a combination of microeconomics and taste in terroir maps. 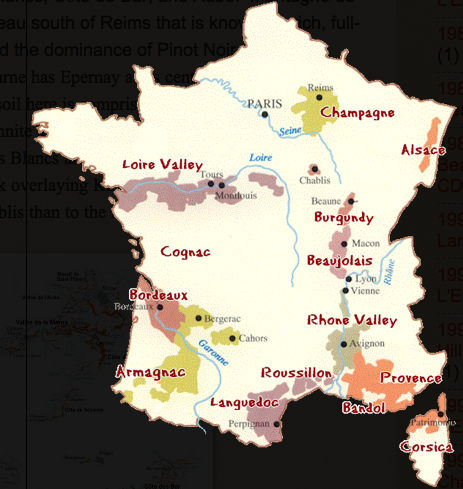 But the maps aim to create a social compact for an economic transaction that has yet to occur: the mapping of terroir was conceived in response to expanded consumption, as a cartographically refined register to track the authenticity of production of goods by crafting a graphic compact against fraudulent wines that protected the local vintner, rather than a statistical record of economic exchange. The 1908 definition of the terroir of Champagne set a legally binding definition of how the bubbly could be marketed under that name. The definition set something of a benchmark for truth in marketing to fix authenticity of regional wines widely adopted to affirm the usurpation of any name outside the appellation–and reflecting to widespread trust in the objective truth of maps. The hope for graphically affirming how appellation was wed to territoriality, analogously to the frontier of a state, may reflect a trust in the civil service, as the Minnard map does. But the format of mapping terroirs created lasting and continuing problems in the essentialization of the qualities of a wine’s taste. 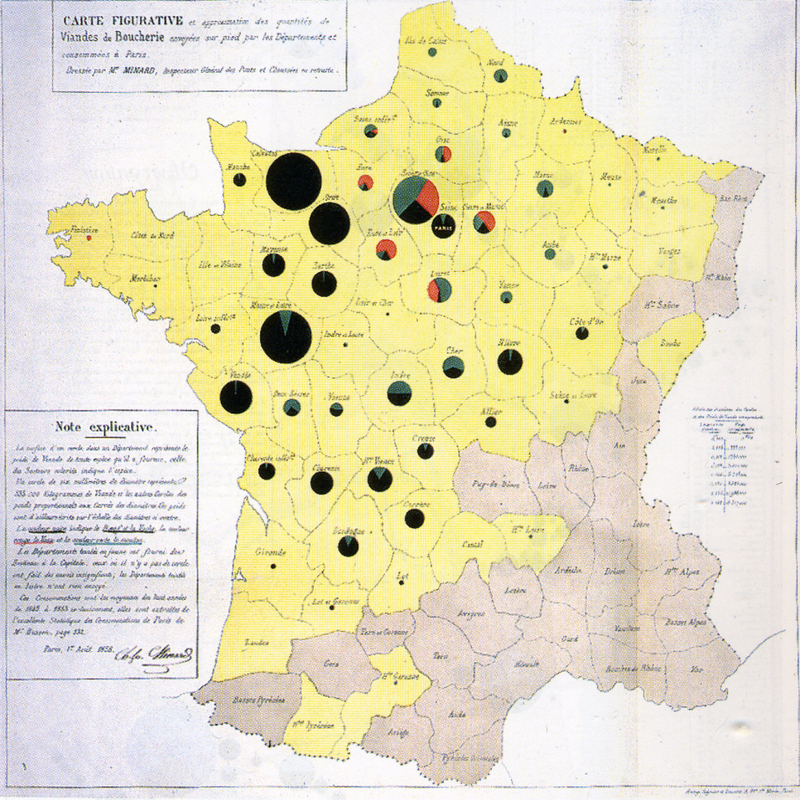 The mapping of terrors provided an affirmation of difference and distinction, even when such variations as weather, humidity, shifts in soil quality, sunlight and a panoply of ecological factors themselves resisted clear mapping: legislation culminated in the establishment from 1927 of formal recognition of the limits of viticulture, grape-harvesting, and pruning of vines within fixed boundaries that recognized the limits of provenance linked to approximate understandings of atmospheric character, quality of soil, and, in the case of Champagne, chalkiness. 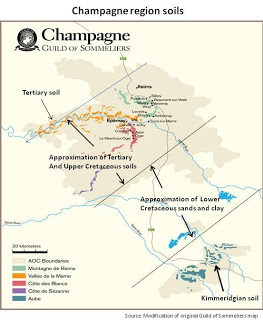 The region of Champagne was mapped to define the distinctive region of finer deposits finer and more porous limestone soils, by limiting Champagne vineyards to some 15,000 growers, or just 3.4% of France’s vineyards, and set a standard that is still with us inherited today as an index of champagne legitimacy, and define the monopoly of its “authentic” producers–as well as establish the authenticity of Burgundy, Beaujolais, Bordeaux or Cognac as well as Loire wines: if it is on the map, it authenticated. Yet the notion of such a DOC is distinguished form territorial sovereignty or from recognizable divisions of landscape or space. The advances in statistical mapping and geosciences of course created a far more complex definition of tracing of key qualities in the glasses, which greatly encouraged or facilitated a romance of attachment to local vineyards that was cultivated as much for urban tastes, taken as transparently or accurately translating local knowledge of viticulture to the marketplace in ways that intersected with cartographical practices and skills, even when upsetting usual notions of cartographical continuity. There has been a huge demand, however, to adapt techniques of climatological and geomorphological mapping to defend the privileges of being able to use a given name, or defend the rights to one’s DOC status, in an age when consumers usually balance limited access to information about vineyards with deep curiosity about identifying the intrinsic qualities of a given wine. 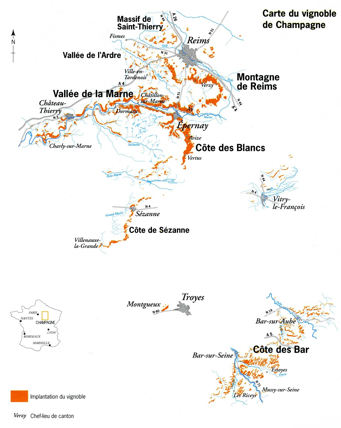 Each region has its own geological profile that determined the unique taste and quality of its grapes, full-bodied in the Montagne de Reims plateaux, influenced by limestone topsoil in the Vallée de Marne, whose topsoil is distinguished by chalky layers of Belemnite and Micraster, or Kimmeridgian soil in the Côte des Bar. 3.. Terroir is of course re-mapped in terms of the experience of of tasting a given wine. 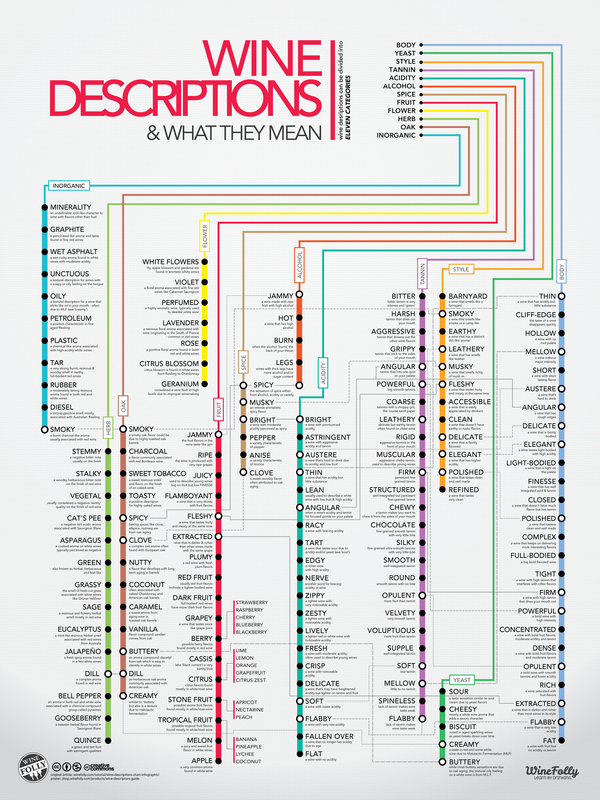 A predominance of descriptors are linked to values of minerality in ways that romance the ties of wines to the qualities specific to the earth that nourishes wines. As well as fruits or flora, think of the many descriptive notes that summon the physical characteristic of place that determine individual taste: earthiness; minerality; grassiness; stoniness; crushed rock; chalkiness; crumbliness; gravelliness; paving stones; hints or flavors of slate, schist, or silex–that suggest an un-mediated expression of a region’s geology, as if the taste derived from a geomorphological profile, rather than being judged by the wine-drinker. 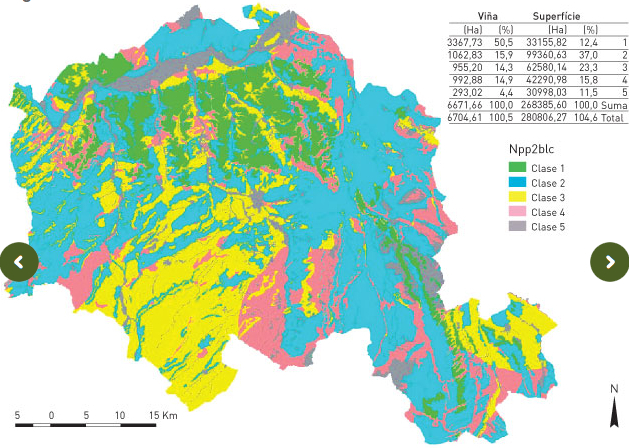 A simple cross-mapping of viticulture and soil qualities reveals the constructed nature of wine regions, and undermines the terroir map’s naturalization of uniform local geological profile or soil-characteristics: this cross-mapping of viticulture and soil qualities reveals the constructed nature of wine regions, and the constructed nature of any attempt to naturalize regional provenance by a single geological profile. 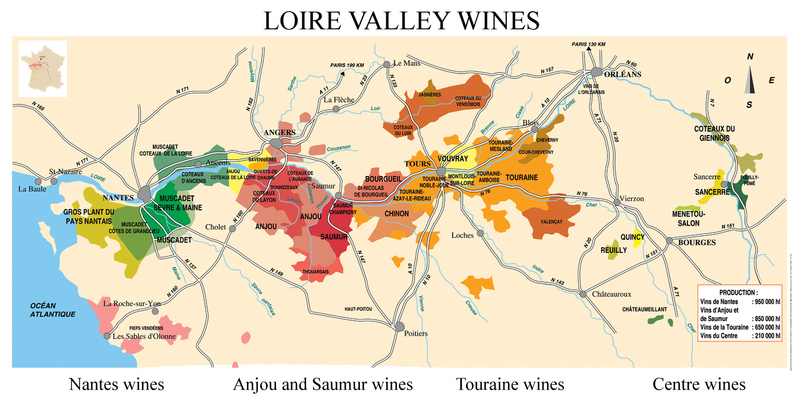 Is there a more recent deconstruction or fragmenting of the wine map to the degree to which appears the case, as terroir is affirmed by subdivisions to situate taste in a specific location? 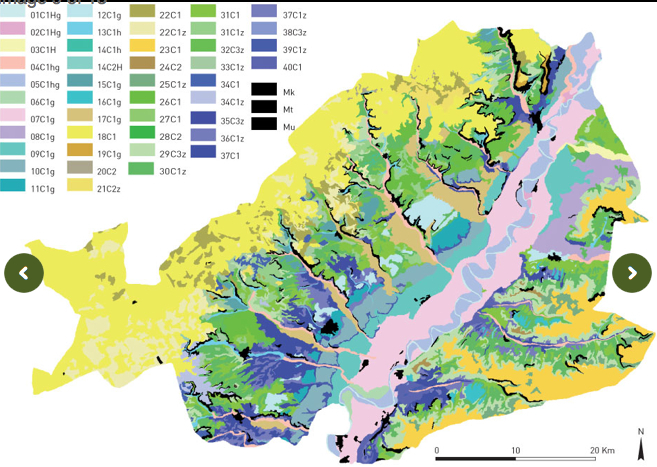 Or of the DO in the Cigalle, the soil map throws into three dimensions an almost plastic record of local geomorphology, here represented at a scale of 1:50,000. It is difficult, if not impossible, to effectively rationalize the contributions of different climactic and ecological variants within a region that can be mapped in such transparent ways. And yet the placement of the bottle on the terroir map is a sign of quality, and a reassurance of protection in the marketplace of a substance whose varietals are difficult to substantiate as natural, and whose qualities are impossible to naturalize by provenance; and so we use the map to denote distinction and draw clear differentiation among oenophilic competitors, to draw sharply distinctive origins around riverbanks, across a varied mosaic of geological differences. 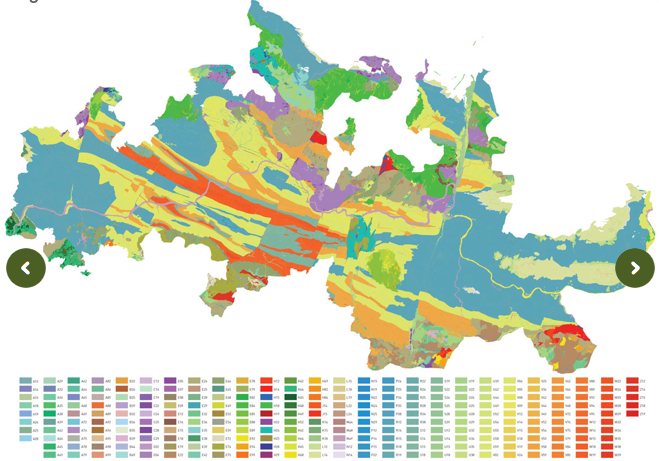 The mosaic of regional wine differences masks the minimal differences drawn by aromatic descriptors, but surely masks the indeterminate nature of actual data by presenting them as inherent in the region’s micro-climates or micro-ecologies of increasing geographical refinement. The less official cartographic representation–although this map with an apparent provenance from a wine label seems remarkably detailed. 4. 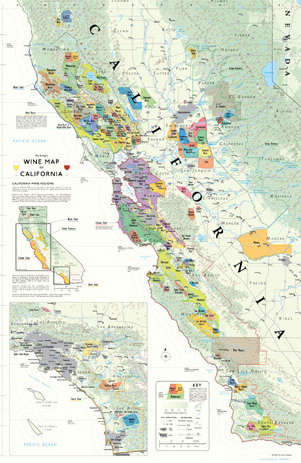 So habitual is the mapping of terroir that the mapping of California wines became a means to invest the grape with a level of distinction and proof that it can hold its own; status is effectively conferred by a recognized coloration of recognized regions of viticulture. Napa Valley was the first recognized “American Viticultural Area,” in a polemic response to French assertion of terroir by 1981, after years of its popularity and promotion, as if in final response to the denunciation of lack of recognized terroir among California wines. Robert Parker had indeed felt so lambasted by terroirists who “latched onto terroir in the 1970s,” to critique California vintners and wine-promoters for imposing a “bland style” of wines on the world of buttery Chardonnay and bold Cabernet–whose powerful fruits were cast as deracinated without Old World structure. As California wines were cast as the yuppie of global beverages, lacking distinct provenance, the mapping of the state’s wines provided a platform from which to assert their legitimacy. 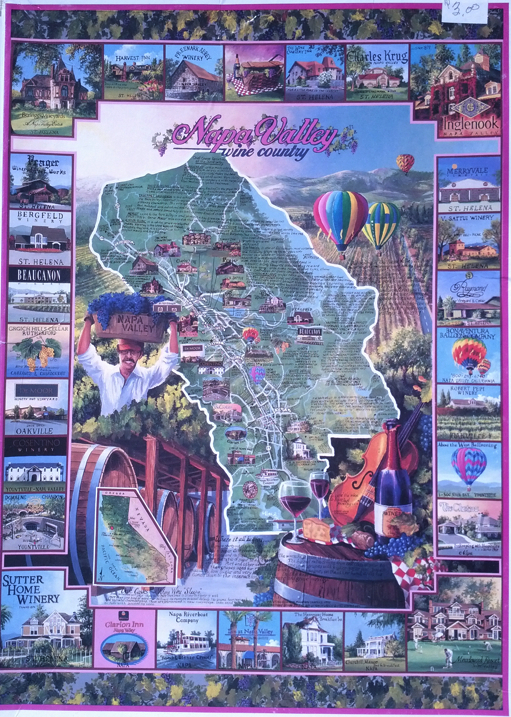 The maps of regions of wine-growing in the Napa Valley had been so widely absorbed an aesthetic of the pastoral by the 1990s as to create a conceptual mapping of the rural vineyard with clear social implications that migrated from tourist maps to popular ephemera. Such maps offer concise arguments for oenological legitimacy–foregrounded above by the inset map of Napa. As aesthetic statements of a wine’s origin, they map nicely onto the recent explosion of taste descriptors–rather than map the local geography in ways that a future vintner would consult–although it is an index to a vineyard’s price: although soil-character is an index for conditions of good viticulture, the vineyard after all precedes the map that places it in a value-system. The recent explosion of northern California vineyards necessitated re-classification by terroirs–if only to combat the idea that Californian terroir is difficult to establish rigorously, and California wine not equal in authenticity to French, and contain the perfect ecological balance into which to transplant, say, Pinot. In Mendocino, Castle Rock Winery assures us, the wine’s nose is distinguished by “headwaters of the Russian River carve a fertile and rugged landscape” in which the cool springs, crisp falls, and wet winters” for Pinot Noir, made apparent in analogies to the Burgundy region of France where the grapes were first grown. Although multiple factors inflect the taste of the wine as it ages, from the cleaning out of barrels to the quality of the oak or wood, to the spraying of grapes or amount of residue on their skins’ surface, Castle Rock proclaims the source “handcrafted wines from some of the finest appellations on the West Coast: California (Napa Valley, Sonoma County, Carneros, Mendocino County, Monterey County, Paso Robles), Oregon (Willamette Valley) and Washington (Columbia Valley),” linking the wine to the terroir to comply with a code of compact for the consumers benefit by the promise to focus their attention to the selection of regional terroir. 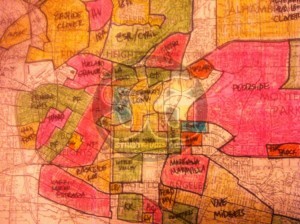 Are the maps of terroir ever of interest to the vintner, or are they as indispensable–and as inevitable–artifacts of the market to the same degree as the combination of 120 florid decriptors in the tasting notes, often designed to manufacture the nose as much as generalize the individual palette? For the map is literally asking us to come along for the ride, inviting us to explore the terroir by well-known paths, lest we lose ourselves in the Napa vineyards along with the busloads of tourists who travel there for wine-tasting every year. The map both mediates and preserves criteria for the elite experience of wine-tasting, and the imagined sacred communion with a select and privileged region that is re-enacted with each glass of wine. 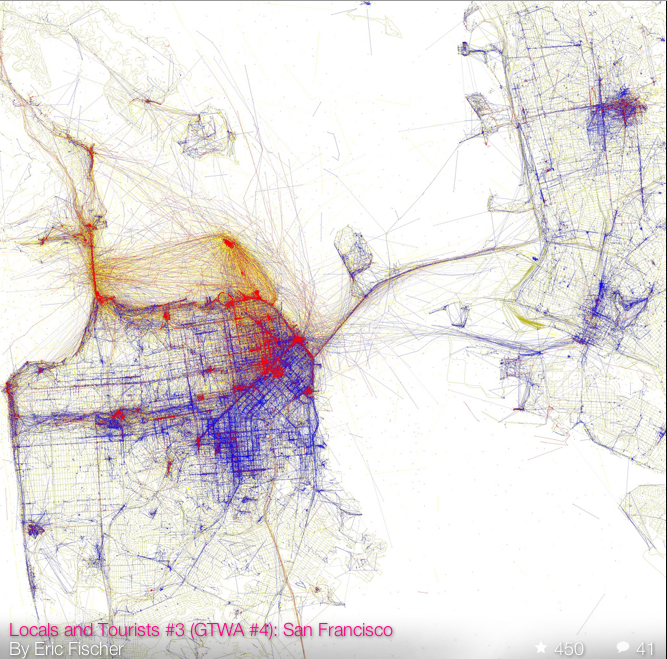 The range of ‘open’ online data that is available for a city such as San Francisco showcases the city’s clear definition of a public space. Although there are plenty of spaces of local meaning and importance in Oakland, from the site of Occupy near the mayor’s office to nearby Chinatown and Lake Merritt, or from Fruitvale Station to west Oakland urban farms and on to Alameda, the fragmented nature of public space is difficult to map coherently. The sprawling city challenges the abilities of the social cartographer as much as the post-modern space of Los Angeles, even in this real-estate view. Maps of any scale organize social space by relevance, preparing a selective record of its inhabitation and revealing networks for ready consultation. Maps of any scale create a simulacrum or construct of social reality, as much as simply orient their readers: the city’s salient features highlighted and network of organization explained, omitting other spaces and residents. 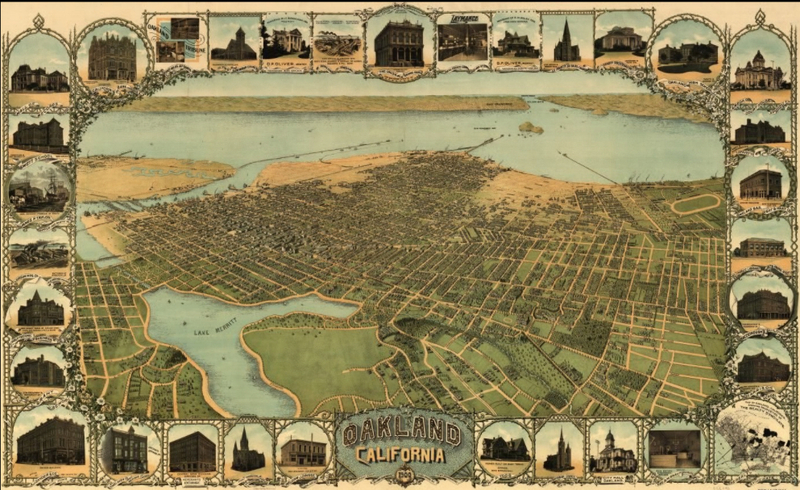 We might start by acknowledging how the below bird’s-eye view of Oakland from c. 1900, of unknown origin, celebrating the city’s settlement and early Bay Area Real Estate: the engraving showcases an open urban grid as an area becoming future realtors to its shores: if mostly green and largely uninhabited, presents a prospective view of the city-port as a commercial center, showcasing notable houses of prosperous residents that distinguished Oakland’s built environment, and beckoning viewers to its estuary and the man-made shores of its new Lake as if to shift our attention from the city of San Francisco. Elevated or “bird’s eye” views praising urban identity and architecture such as this anonymous print had a long tradition. Such imagined constructions that gained currency as encomiastic forms, often complemented by poetic paens to their social harmony. If the artist who engraved and designed the elevated map is not known, the presentation of the city’s growing physical plant and street structure echoed the architectural elegance of earlier urban views, as the visual encomia to the elegance of architectonic form of Venice in the virtuosic perspective designed by Jacopo de’ Barbari circa 1500 of his own creation. De’ Barbari exploited skills of perspective to craft a graphic and pictorial encomia to his native city’s architecture and burgeoning wealth to trumpet its social distinction; an earlier elevated view of Florence, sold by the cartographer and engraver Francesco Rosselli similarly celebrated and displayed the architecture of his native city. De Barbari famously employed to evoke the harmonious order of his city, also lying in close proximity to surrounding wetlands, by displaying its distinctive harmony–vaunting its delicate socio-political balance figuratively by deploying his mastery of creating a previously unimaginable perspective to considerable effect, showing the density of its architecture in the watery surroundings. 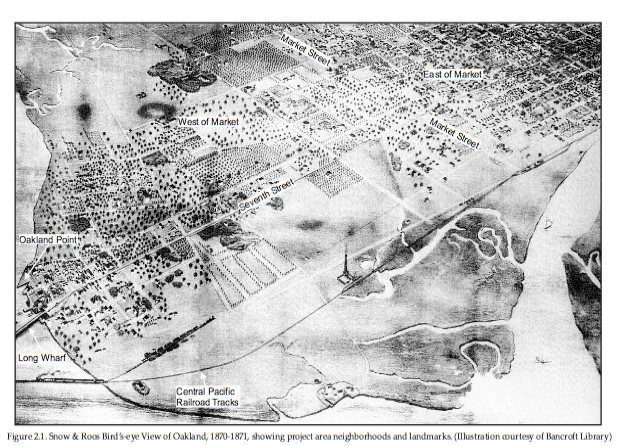 Even if much of present Oakland seems a bit of a blank slate, whose territory expands from its port and the man-made lake built to beautify its urban estuary, the print of c. 1900 divides plots and settled acreage, as the surrounding images of buildings that testify. This is not only a pictorial space, but an attempt–as the Rosselli and de’ Barbari maps–to show the social space as harmoniously mapped to a pictorial space of representation, and distinguish the city as a microcosm of the world. Both maps offer sophisticated visual glosses on the ancient notion of a “chorography” or qualitative view of a community, elegantly overlaying and equating their imaginary perspectival space with he social spaces of each city. 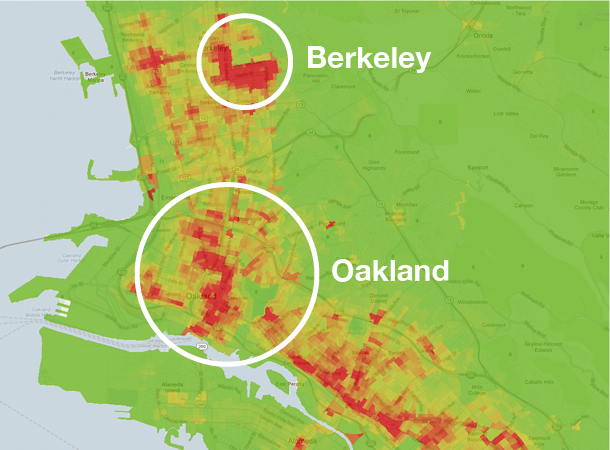 Can we create a modern chorography of Oakland that both displays and comprehends its dynamic heterogeneity, or would the city split into social divides? 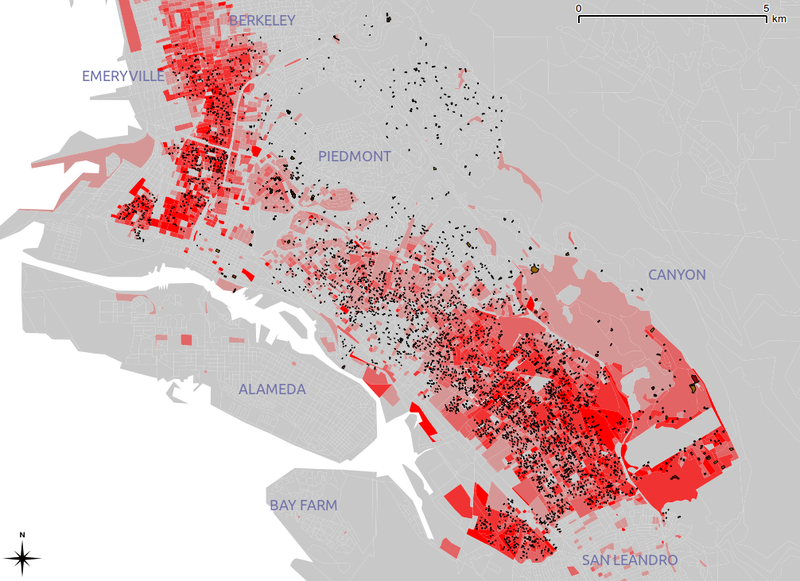 Google Maps clearly fails to do so, but what would a comparable mapping of Oakland’s populations look like, perhaps mapped from the ground up–in the manner that Jacopo labored to achieve? There was clear redlining of much of the East Bay’s residential areas in real estate maps for the East Bay cities dating from the Depression, in which Home Owners Loan Corporation rated neighborhoods for the refinancing of mortgages that amounts to a reflection of the value of property in the East Bay, and reveal an odd mosaic of the city that privileged some regions, but also include a clear redlining of those regions by the Bay and the main arteries of transportation that continue to define Oakland’s port. The red-lining of the city’s residential areas in the New Deal structured the city’s social geography in imaginary construction ofways that reflect the continued exclusion of African Americans and blacks from the market of legitimate home mortgage in much of America through the 1960s, described so compellingly by Ta- Nehisi Coates, and in Oakland not only reflect the deep divides in residential ownership but created social disparities but record scars that make the city’s future harmony particularly difficult to re-imagine. The zones of imbalanced opportunities for home ownership that long existed in the city created perpetuated deep social divides among its residents, often left without the chances of refinancing that were available to many other residents from the 1930s in the United States, as its port and low-lying areas became victims to a classic image of “blight” with roots in its deep abandonment by the public good in ways not yet overcome. 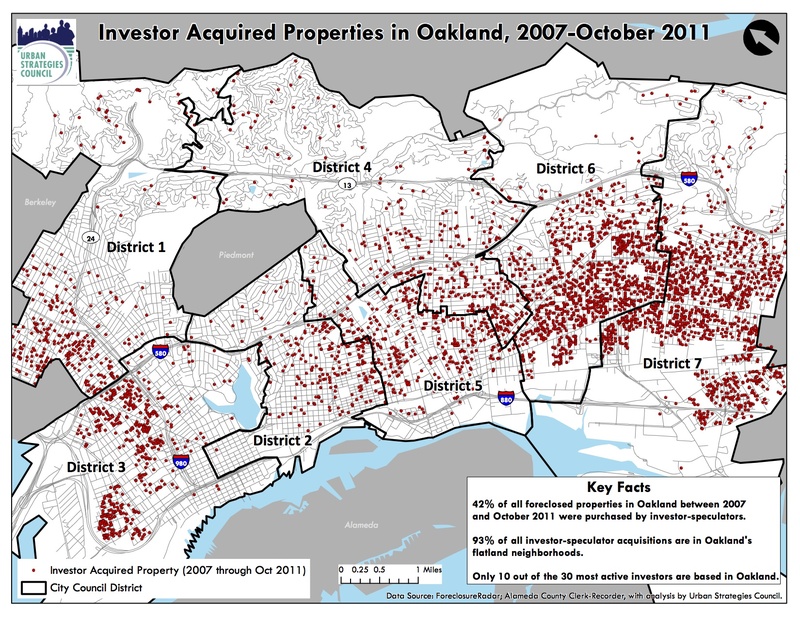 From the first settling after the San Francisco earthquake of the Oakland hills, the demographic divides Oakland’s settlement seem to have been reflected in the value of residential ownership in its neighborhoods in ways revealed in the fractures lines of the map of the Home Owners’ Loan Corporation, and which have continued to divide its neighborhoods even after a period of urban growth. The absence of clear neighborhoods or community organizations around the major traffic arteries that Oakland has long been defined by at its port and older shipping canals created something like a social divide not only in this early HOLC map, but that has been perpetuated within the socioeconomic divisions that were so starkly reflected in the “red-lining” of urban real estate. 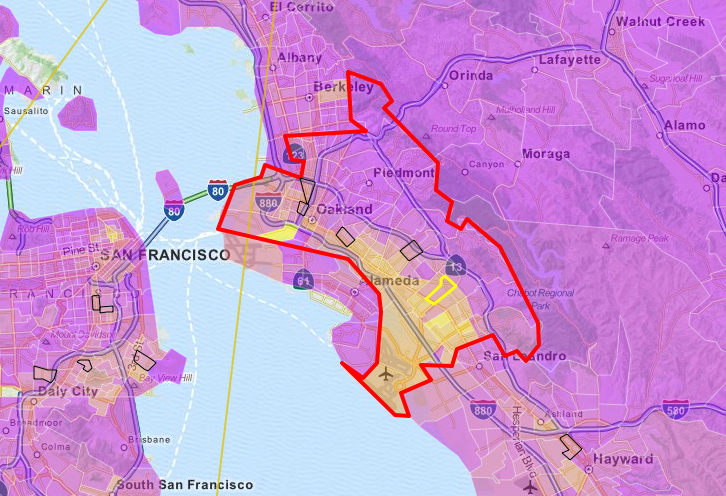 In a year that boasted crowd-sourced mapping of the San Francisco Bay, organizing the demographic divides that continue to shape Oakland deserves our sustained attention–and the varieties of viewing the divisions and distributions in the settlement of Oakland’s space. Unlike San Francisco, dominated by some 359 skyscrapers in its downtown and other regions, Oakland is far more geographically disperse and diffuse, with only a small number of buildings over fifty meters all clustered by Lake Merritt–including those noted in blue, under consideration or construction. 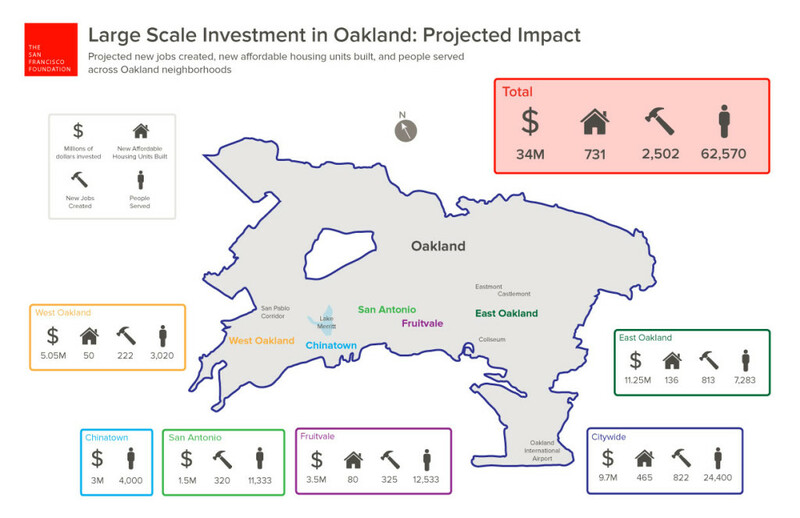 The recent ambitious and brave investment intended to equalize these clear socioeconomic divisions and to prevent them from being perpetuated by public services from schooling to economic opportunity is a step in the right direction and, based on a back-of-the-envelop calculation, seems to have its priorities and direction of resources fairly straight in how it has decided to invest in Oakland’s neighborhoods’ futures. 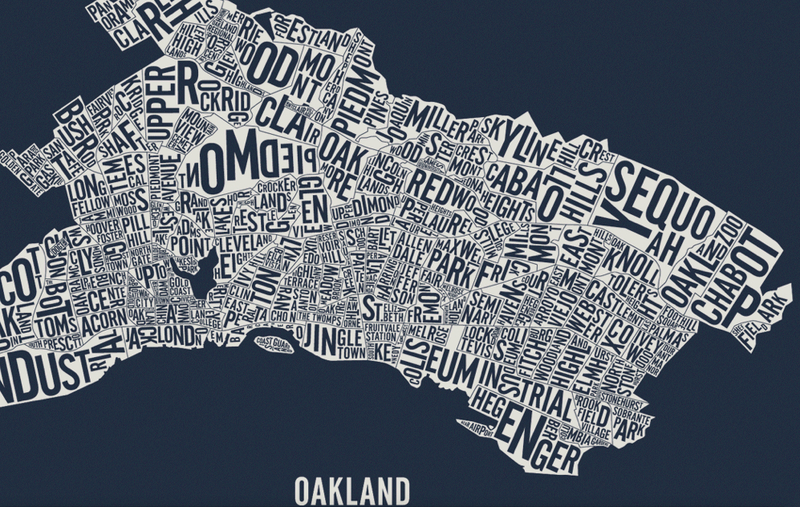 But how to frame and orient the viewer of a map of the city’s demographic divisions is fraught, given the difficulty of uniting Oakland as a whole, or even in abstracting an analogously unified image that connects its disparate inhabitants. 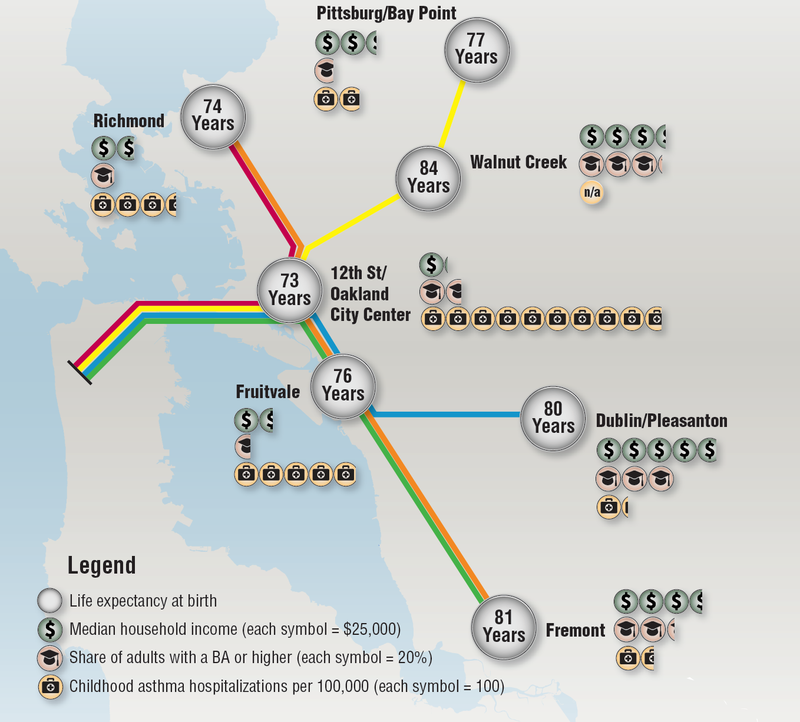 The network that bounds the city was advanced rather optimistically in a map that elegantly promoted the lost or abandoned system of Key Cars whose web linked downtown Oakland to the Temescal and Alameda–the infrastructure for the local economy that it did up until its complete dismantling by 1959. The serviced networks that any map foregrounds, even one of transit routes, engage their readers by networks of inter-relationships. 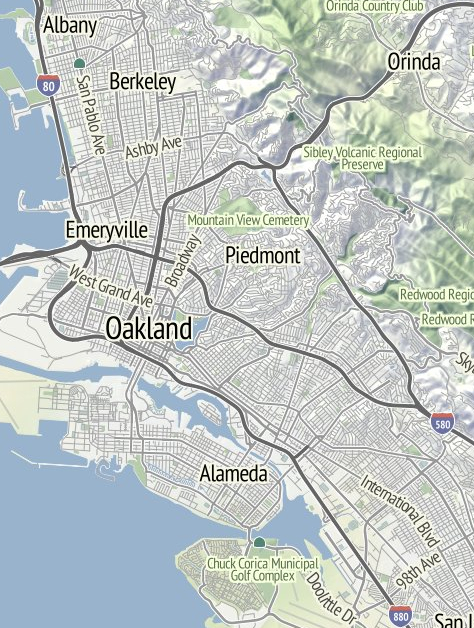 The above map affirms a network of transportation for their rider, suggesting the ways that the infrastructure by which the Key-Car systems united downtown Oakland and the vicinity–much in the manner current BART maps promise to link everywhere in the East Bay in a radius to Point Richmond, Brentwood, and San Jose. 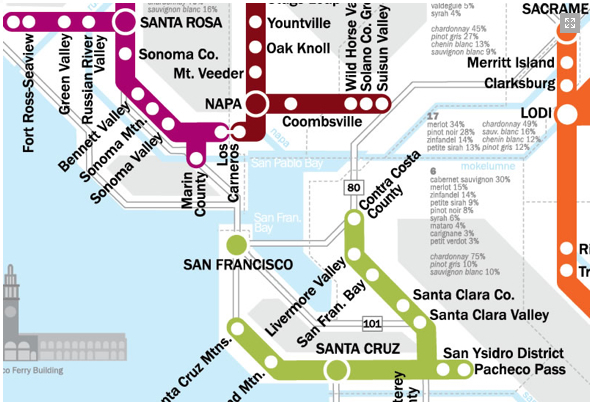 The current BART network may link the Bay Area, indeed, as Oakland seems to be forsaken as being the economic it was by transit authorities and Bay Area residents. But Oakland is also a city whose social space was long both divided and eviscerated, as the network of streetcar transit was dismantled, the railroad stations that centered the town from the 1880s declined or closed, preparing for the razing of the West Oakland residences of many porters for the MacArthur maze, long before the collapse of the I-880 Cypress Freeway in the 1989 Loma Prieta earthquake–and the subsequent massive shifts in home-ownership as a large number of houses went underwater after 2007 led to a wave of foreclosures that was almost distributed across the city, and which redefined its social space once again. The divides and diversity in Oakland make the mapping of the city of particular interest as tools to understand its social reality. In a society where we are regularly mapped and surrounded by maps, the critical of reading maps is recognized as an important tool to negotiate and mediate lived social space. What sorts of divides and continuities emerge in a city like Oakland, historically defined by considerable racial diversity and income disparity? How to map so many variations in one place? When Denis Wood and John Fels described the map as an ideological construction of space or territory, they took time to examine the surrounding ‘paratext’ to maps as keys or markers that revealed the ideological construction of the space within the “nature” of the map, created by interpretive legends and iconography, as well as the semiotic conventions of the map itself: yet interactive urban maps provide much more of a creative cartographical conventions and treat the map as something like an open text. In their critical examination of the authority inherent in the medium of the map, The Nature of Maps, Wood and Fels argue that the relation between a map and territory exists through how cartography–as much as cartographers–“constructs the natural world” in relation to other sign systems, construing the relation of a ‘map’ to ‘territory’ by how maps inescapably make their subject ideological. Taking as their case in point maps of nature, they argue the order of maps demand assent from readers through what they call the ‘postings’ and the relays that the map creates to the world it ostensibly depicts, and the new understandings of space it creates. Wood and Fels argue “relays” in maps, tied to the texts inherent in them or positioning in books or paratexts, which uniquely promote the construction of meaning, effectively organizing complex mental spaces to understand nature in maps, whose structure demands assent to create truth-claims about nature, and transform the space of the natural world into a structure by which nature is spatialized as known. The Barbari and Rosselli views assert an ideology of the local, spatializing the city as it is best viewed and encomiastically celebrated as a microcosm, even though the “paratexts” by which one reads a map are left tacit for their viewers. Yet the map does not begin from an empty space, so much as it is rooted in a space that is inhabited: it indeed tracks multiple networks of inhabitation. Tempting as it is to argue that social space fills in the empty space of a geographic region, the maps of Oakland’s inhabitants suggest a remaking of the city’s social space–and present an image of the remaking of that space viewed from the ground up. For rather than providing a fixed or authoritative transcription of space that promotes “a standard scientific model” that creates a “mirror of nature . . . through geometry and measurement,” as Harley wrote was endemic to the discipline of cartography, or invest authority in a single map, the variety of Google Maps templates to plot data from the US Census for the years 2005-9 create a set of multiple maps in themselves each provisional, which they invite viewers to act by ordering their content. 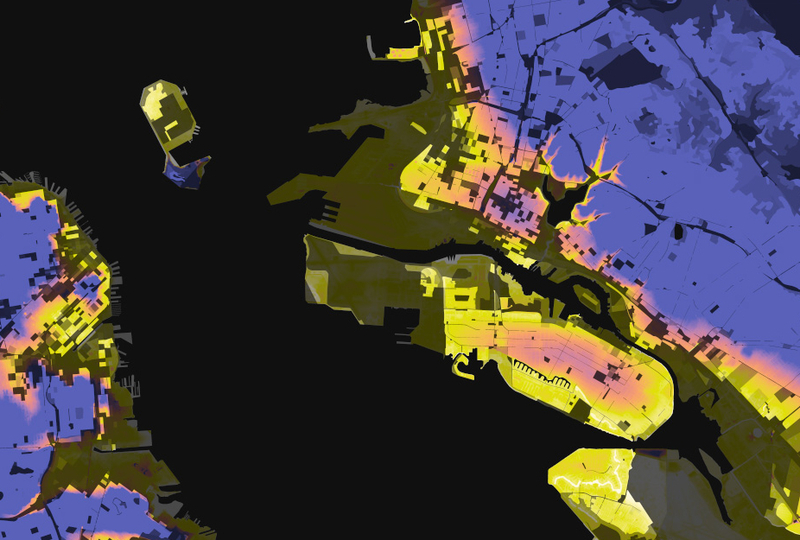 It is perhaps no surprise that, in an age when maps proliferate, and we are both regularly mapped and surrounded by maps, the appeal of the website is that it provides tools to select variables and determine geographic parameters about the city that we can know: indeed, their interactive nature provide a shifting notion of a map as a graphic fixity. Wood and Fells primarily examined the organization of space within the printed map, critically reading map’s insertion in printed texts and their relation to the semiotics of written legends. 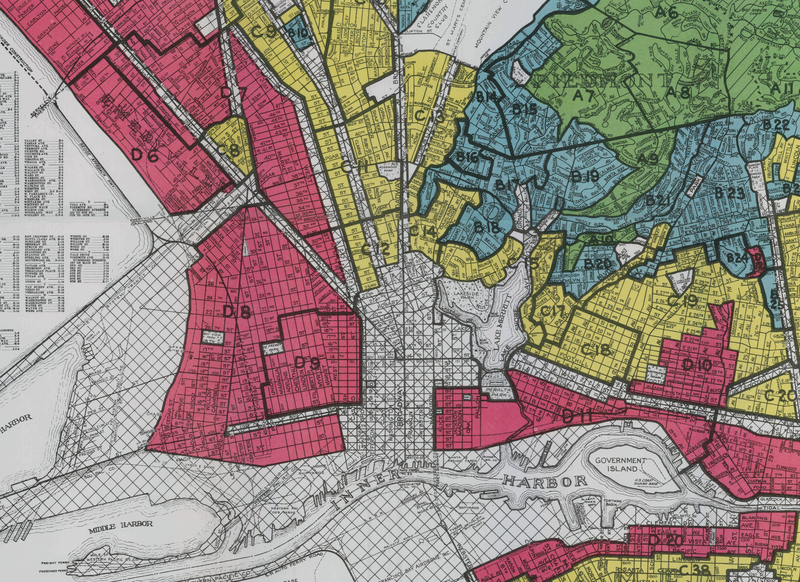 The compilations of maps based on census data offer, at a far greater granularity than other maps, to divide space by variable criteria of income, race, or level of education to offer what might be treated as elements of a composite picture of the city’s inhabitants–from the ground up–rather than demanding assent to a given cartographical record. In a sense, the interactive maps below start a discussion about the nature of mapped space from which one can begin to examine the city’s social space. 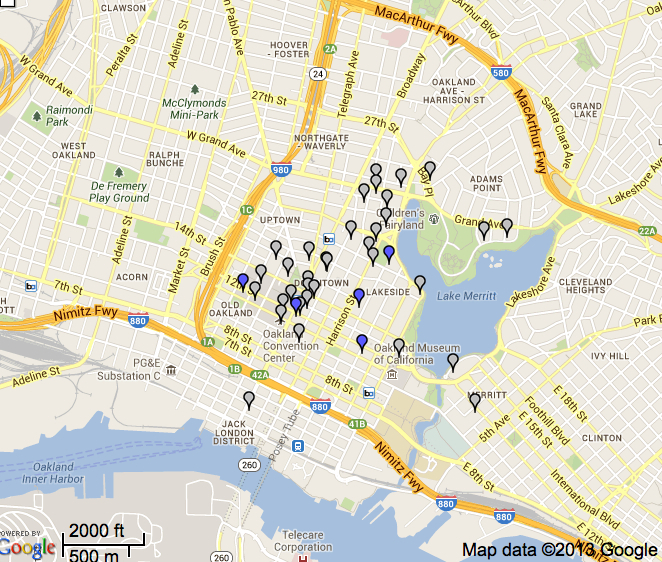 The interactive map creates an open text whose variables and criteria users can create. They provide a basis to question, critique and re-evaluate question the dominance of stereotypical categories of local violence or gangs as relevant descriptors of the city, but provide a bit more complex picture of its social composition. For the interest of these maps lie in how viewers map them as simulacra against their mental maps, rather than in their mimetic claims: ‘simulacra’ since all maps are both filters of information that parse the relevance of social space and embody a coherent order of space, providing deeply social tools for reading. Rather assigning integrity to the map as a unique document, we can understand its ‘social life’ through how each creates and constitutes its own social reality for readers: the Google Maps templates offer a basis to refract socio-economic distributions in the city, rather than fetishize the authority of the given map as a form that commands assent; the familiar templates increase the improvised nature of the comparative mapping exercise. But Matthew Block, Shan Carter, and Alan Maclean are also particularly inventive graphic artists in how they use of Google Maps–especially in comparison to how it is usually used by others. 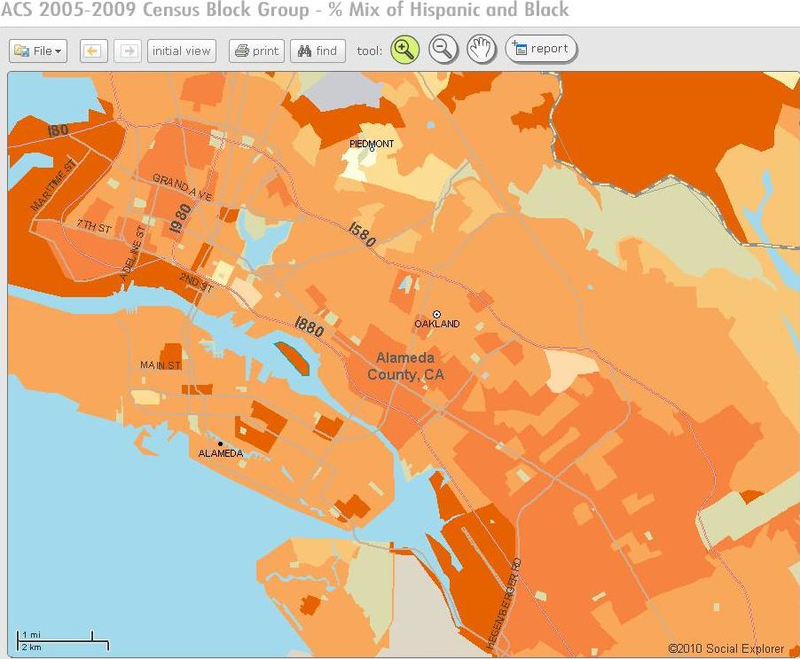 The interactive maps created from the Census Bureau’s American Community Survey provide tools to track social realities across the nation, and filters to view specific variables in each zip-code and neighborhood. 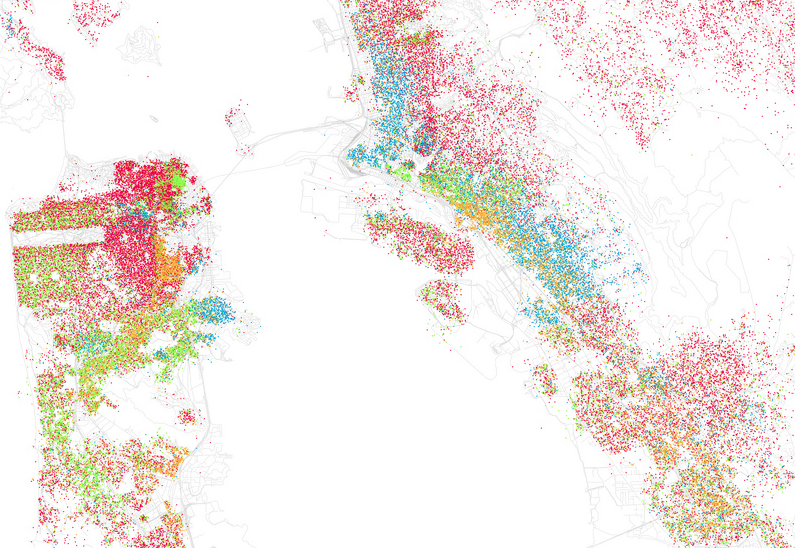 I’m interested how maps embody Oakland as a coherent entity, and in Oakland a test-case to examine maps as embodiments of space and to illustrate spatial divides, as well as to filter different aspects of social space. The interactive maps devised by Block, Carter, and Maclean employ Google Maps templates to invite viewers to process the coherence and divides within data from the US Census in spatial terms, using data for the years 2005-9 to create multiple maps, generated on demand, that refract or mediate statistical realities in visual formats which provide compelling ways to embody and understand social realities from the ground up. The statistical “maps” map at stunningly finer grain that reality–by “Mapping America: Every City, Every Block,” as they boast–that use tools of mapping creative interventions to analyze the Bay Area and its inhabited landscape; the mapping forms offer tools more than vehicles to demonstrate variables of race, income, education, or presence of recent immigrants, offering alternative models by which the region might both be mapped and, by extension, surrogate realities by which its composition might be known. As much as surrogate realities, they refract pieces of that reality that we must juggle and assemble for ourselves, less attentive to the semantics of the Google Maps frame than their content. 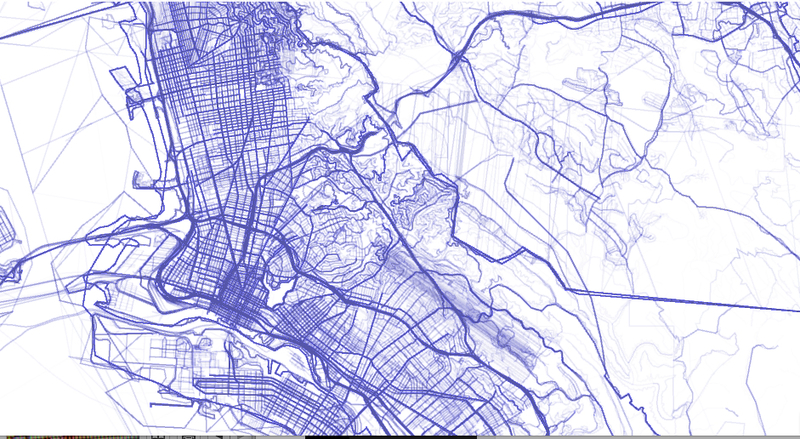 One might compare them to conventional maps based on skimpier data, to which their detail and agility provide a sort of foil–starting from the graphic charting crime-density in the Bay Area based on the police blotter. The map is surprising for how the area immediately around the campus is a thick blotch of indelible red, bleeding into its nearby areas and along Telegraph Avenue like indelible ink. Most of this “crime” is based on calls to the Police Dept., including a significant number of calls about problems of noise around fraternity row: the impermeable barrier both around campus can be explained by the different policing agency that supervises the university’s campus, and the boundary of the Berkeley Hills to the East. Crime is mapped not only indiscriminately, but distributed to reflect the contours of public complaints, as much as actual crimes. 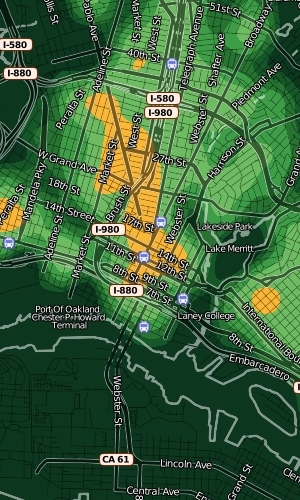 Although the red splotches and streaks around much of Oakland and focused in its downtown seems in keeping with the difficulty of maintaining control over the dispersive city, while around UC Berkeley are dense stains of intense crimson that corresponds to the frequency of calls that the local police receive near campus. 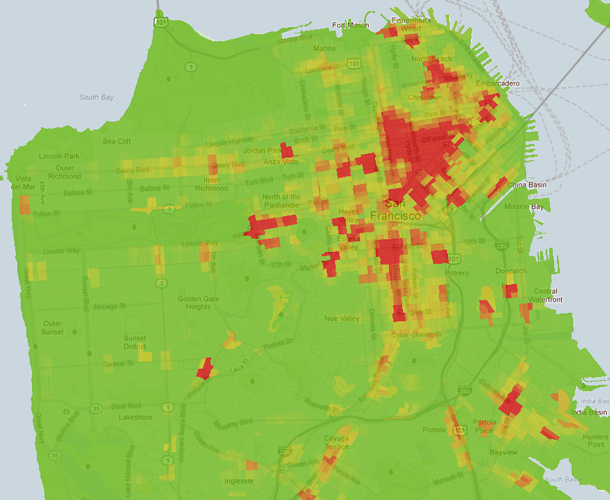 It is interesting to contrast the map to that of San Francisco–where a huge amount of crime is clustered in the downtown, near the Embarcadero, Tenderloin, and Mission and some pockets around Van Ness–in a broad field of relatively crime-free green. 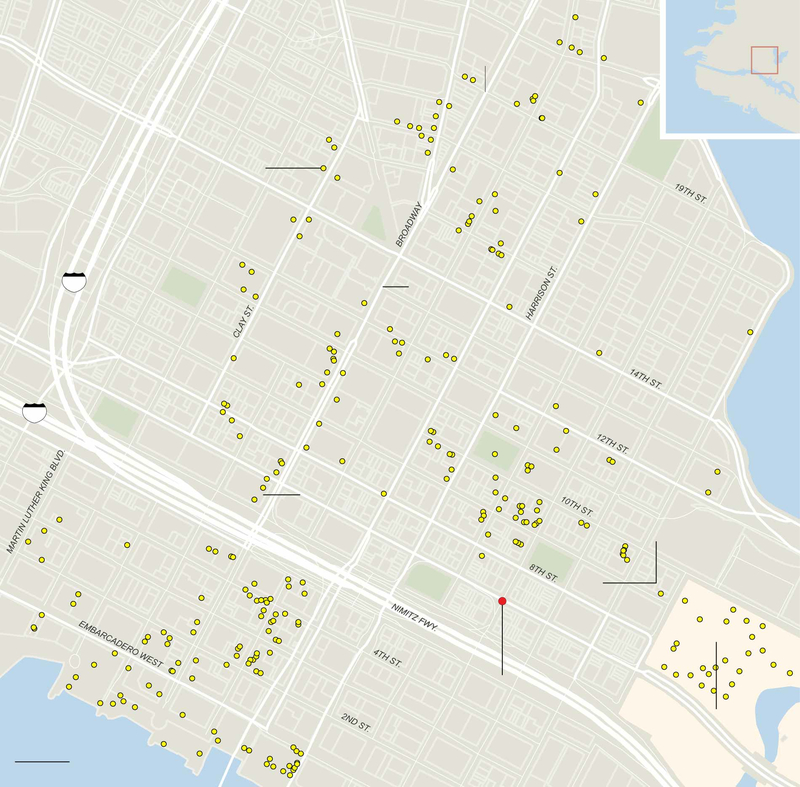 The map of hot-spots of violent crime provides a different picture, if a tragic one, extending along the city’s major streets deep into East Oakland. 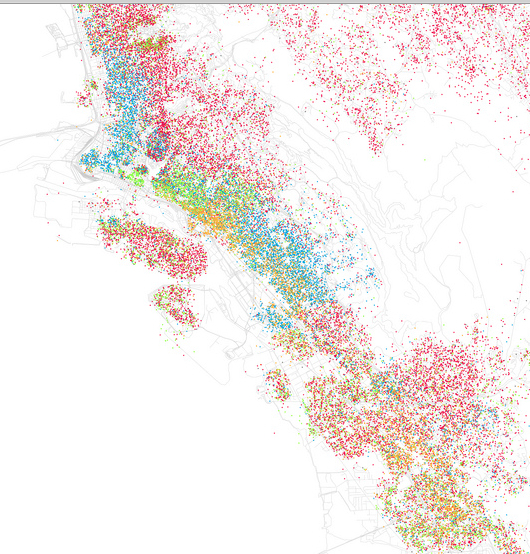 One might ask how this maps onto the city’s racial diversity. Given common predispositions, it might make sense to reflect on the city’s composition with greater granularity. 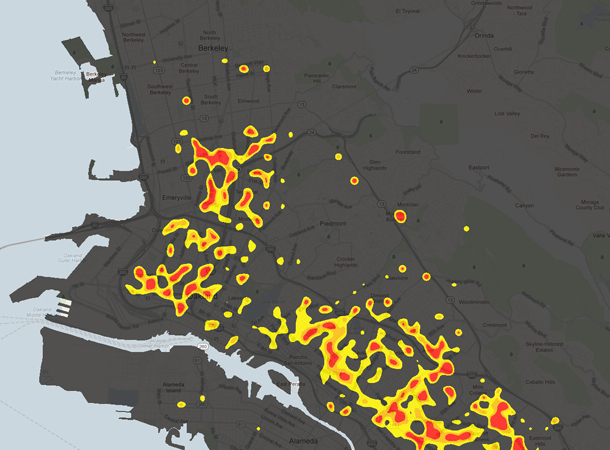 Does violence correlates to the complex ethnic or racial distribution of the city? or to income? or to gangs, as often suggested? The interest of the interactive maps lies how viewers map these simulacra against their own individual mental maps, as much as in their mimetic claims: ‘simulacra’ since all maps are both filters of information that parse the relevance of social space, providing deeply social tools for reading. Rather assigning integrity to the map as a unique document, we can understand its ‘social life’ through how each creates and constitutes its own social reality for readers. 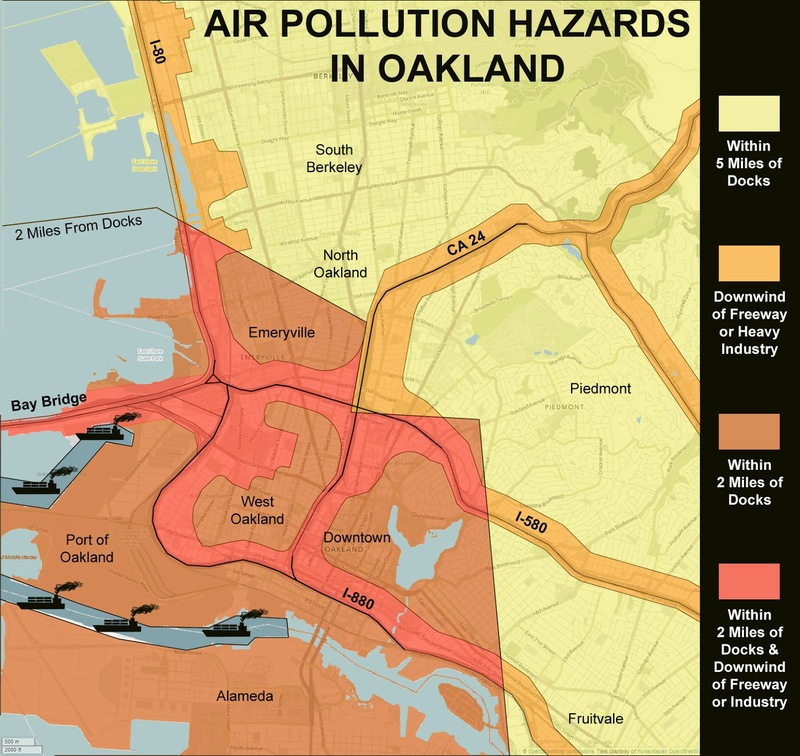 Aside from the heat-spots in West Oakland, race is not a determining factor in a clear a way at all, although the ethnic diversity of Oakland–a historically African American city with a rapidly shrinking number of areas dominated by African American populations. 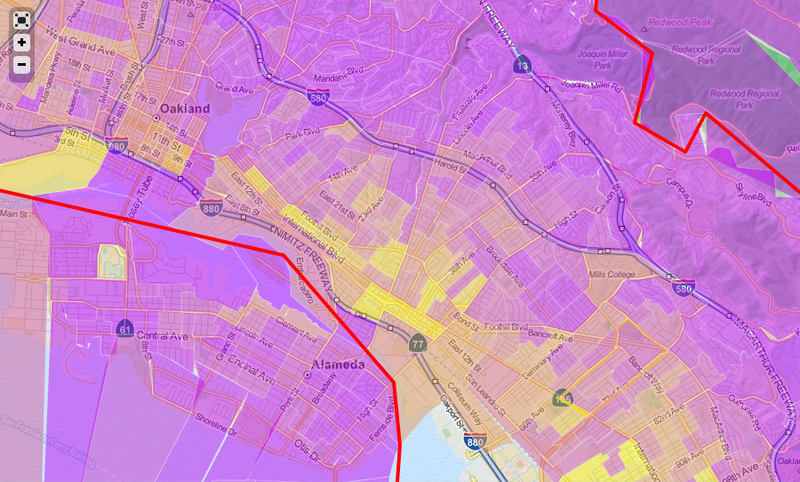 It’s in fact striking that the greatest mix of black and hispanic Oaklanders in any neighborhood occurs on the edges of Oakland: and that the island of Piedmont is the only area that’s white. We see a different picture of Oakland if we look at outside racial self-identification, but examine economic diversity at a finer grain in its neighborhoods. 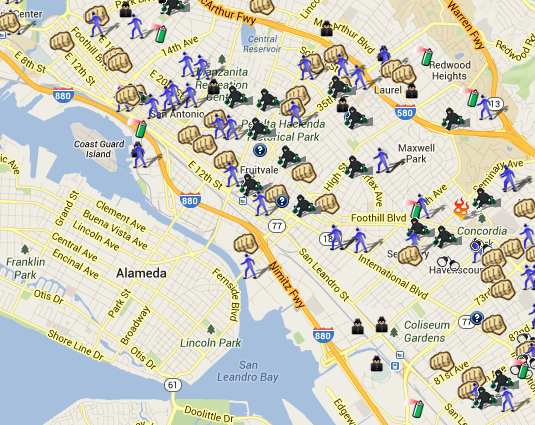 What kind of image of Oakland emerges? It’s difficult to map it clearly. 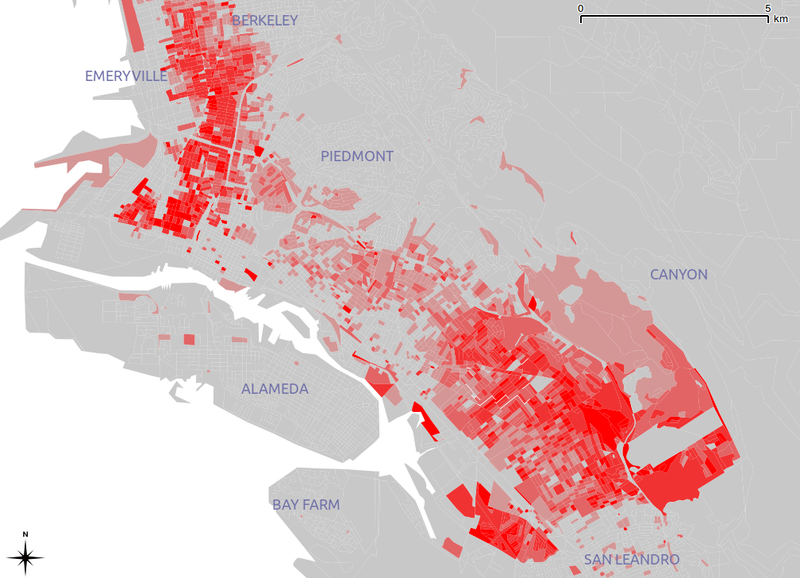 One striking effect of the greater scale and definition of the maps based on the 2010 census is that the considerable proportion of resident immigrants in the city, which reveals a considerably high percentage–often more than half and up to 70% if not almost 80% in West Oakland, across from Alameda–of foreign-born residents, which demonstrates a considerable geographic mobility among residents that seems specific to the area: Oakland has long been a cosmopolitan center that attracted the displaced to its margins. Immigration is not criminality, but suggests the margins of the city are where the displaced arrive: displacement might be something of a thread in Oakland’s history, from the arrival of (far more wealthy) San Franciscans after the 1906 earthquake in Piedmont to the Chinese-American railroad laborers who settled downtown, the railway porters whose families created a large community in West Oakland from the 1880s, and workers for the shipyards, or rich communities of Eritreans, Africans, Native Americans (Lakota or Dakota), Hispanic, Hmong, Vietnamese, Somalians and Congolese who most live in cheaper housing and are likely to be taken advantage of in varied ways. As of 2004, Oakland somehow ranked tenth in the US for the largest number of immigrants, according to the 2006 Census, despite a less vigorous local economy, and almost 30% of its entire population is foreign-born. The margins of the city somehow remain greater and far larger than its center. But Oakland remains known, despite this mobility, despite the presence of city gangs, a more deep-seated and almost endemic presence and prime descriptor of the city. One can–and many do–blame gang-violence, or the competition for turf; but the violence is difficult to separate from prostitution and drug-related crime, not necessarily competition between gangs or gang-related activities, even though gangs do suggest a culture of violence. 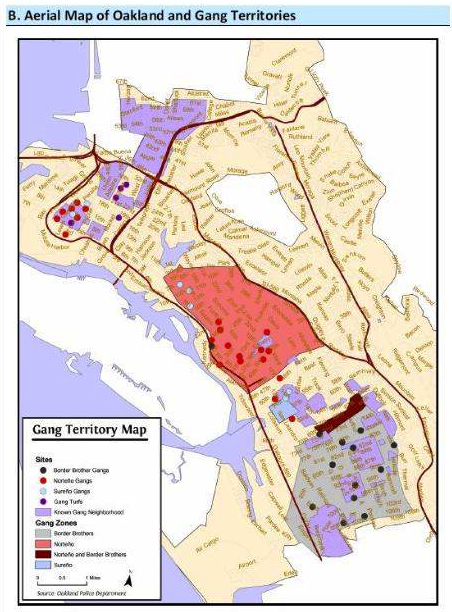 Gangs are difficult to measure, although the intensity of turf-wars would seem to make it easy to use the map as an indicator of violence. Perhaps their presence itself reveals an attempt to make meaning from life or to carve it out of one’s social terrain to the greatest extent that is possible. 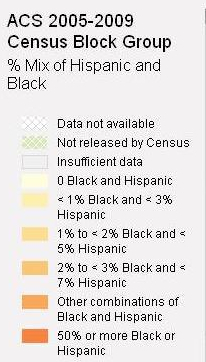 One compelling map maps educational attainment–with the brightest yellow indicating an inability or difficulty to complete High School at 70%–with less than high school completion hovering around 40% among families. 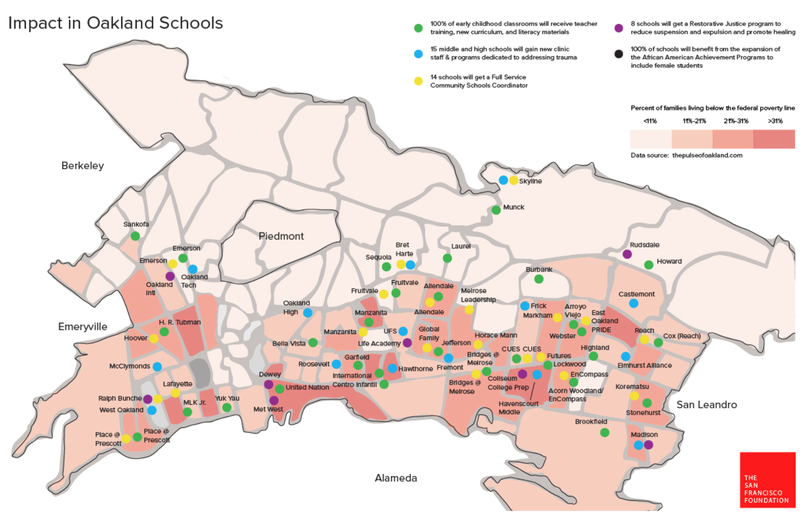 In the Bay Area at large, the failure of education in the Foothill-International area is striking, and is doubtless also some degree of failure in socialization if not of public education, and maps a continuing challenge for the city’s School Board and public schools. 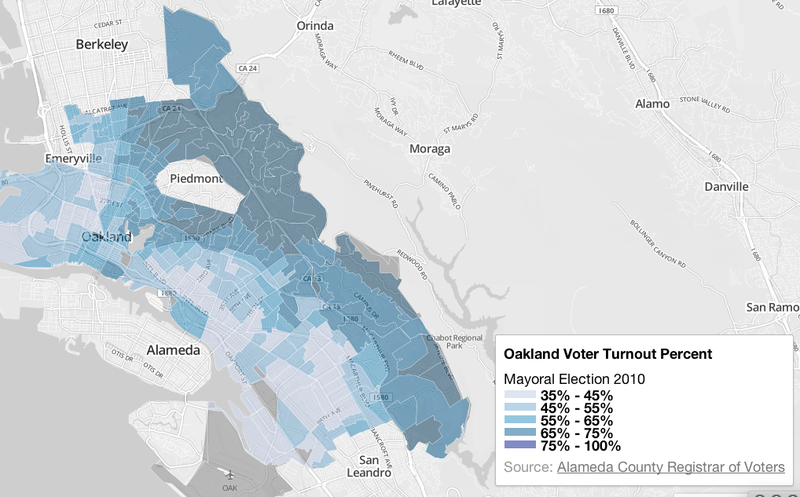 Those empty tan regions are a measure of the difficulty of shifting a divide between different Oaklands, because it maps a cross-generational or at least temporal divide in the given area over time. 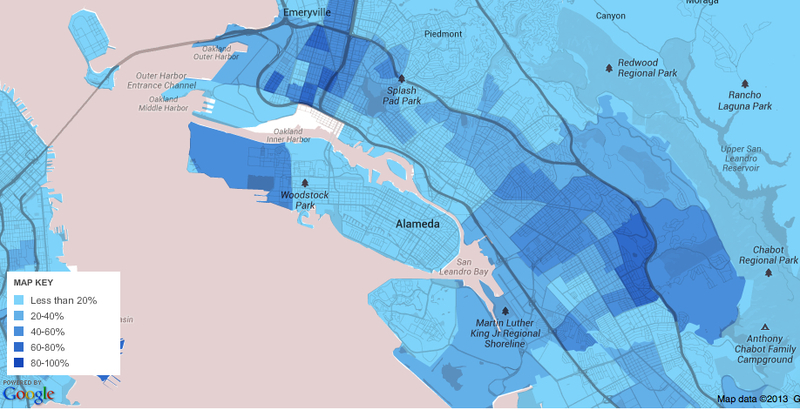 The heterogeneity of Oakland is nonetheless striking even in its inequalities, to turn back to map racial diversity of Bay Area generated in bright colors on the NYT website of Block, Carter and McLean, since it suggests a picture of considerable promise. But of course a map is not a picture. It is a picture of variability, which can shift depending on one’s chosen criteria. In the distribution of income levels in North Oakland, aggregating incomes of twelve families reveals a telling integration of an income-mix more striking and apparent than the in the above demographic models: despite a scattering of upper-income levels across this North Oakland area from Emeryville, across San Pablo, and up to Broadway Terrace and Grand Avenue, lower income levels are present virtually throughout the region, with the exception of East of Broadway, although Broadway provides a clear dividing line of high incomes and lower ones, and the 880 corridor below MacArthur dotted with light blue markers. The color-coded map of relative incomes provides us with some possibly meaningful correspondences to the hot-spots in crime. But I wouldn’t advance the sort of argument that maps crime–or gun-violence–onto variations in household income. The pictures of the city offer limited tools that suggest possible sites of research that might help to connect these dots. But they offer useful, ground-up mappings of the city’s inhabitants. Processing the relations among inhabitants of Oakland offers a way to renegotiate your relation to the city as a whole. Mapping is about navigating, as well as processing, a surfeit of information, and about making the connections among it, grosso modo, that exist. 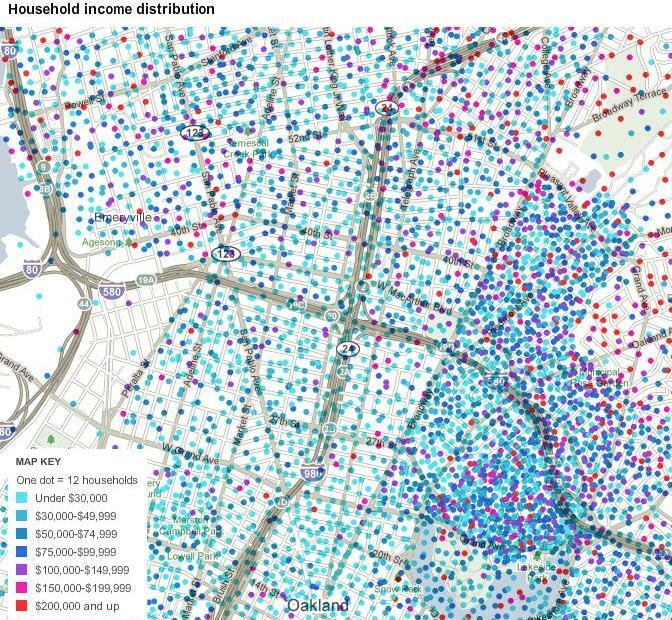 The fine grain of the census maps provides both a corrective to our preconceptions, and the start of something like a more fair–and illuminating–map of the city’s social space.